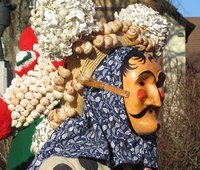 Only showing entries about elzach from Alemannic Fastnacht. 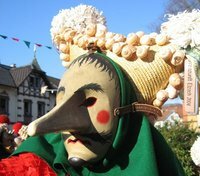 View entries about elzach from all Travellerspoint blogs. 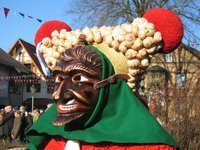 The small town of Elzach at the far end of the Elz valley is famous for its ancient carnival traditions. 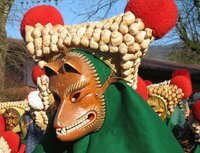 Here you can watch the alemannic Fastnacht at its best, and scariest. 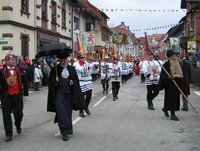 Elzach is one of the most traditional centres of the alemannic Fastnacht and member of the Viererbund. 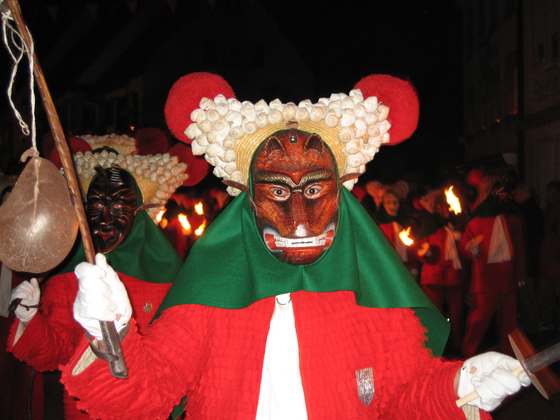 Two types of costumes are all the guild allows: the Schuttig and the Rägemolli, plus a number of singular figures. Officially only males are allowed to participate. 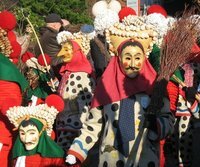 Fastnacht in Elzach begins on carnival Sunday at noon. 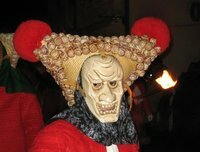 A big parade takes place on Sunday afternoon (15.00), then there is the night parade (Sunday 20.00). Another parade happens on Tuesday afternoon (15.00). 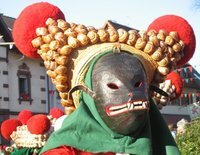 All parades start at Ladhof, east of the town centre, and leads along the main road to close to the train station and the same way back again, so you can watch them twice. If you want a good spot for taking photos be there at least half an hour earlier. 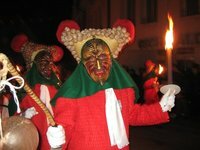 The Sunday night parade, which begins at 8 p.m. on Carnival Sunday, is the most impressive event of the whole Fasnet. All lights in town are turned out. The Schuttigs parade the dark streets with torches, which give a dramatic effect. The masks never look scarier. Highly recommended! 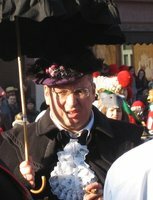 The second typical Häs in Elzach, less frequent than the Schuttig, is the Rägemolli. The name derives from „Regenmolch“, a local name for the fire salamander, because of the black dots. The corners of the hat have paper palls instead of wool, the headcover and scarf may have different colours. The front side of the jacket is painted with a moon, a bat and an owl while the back shows the sun. Many Rägemollis carry a broomstick to tease people with. All parades follow the same pattern. 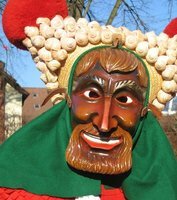 The black Teufelschuttig (Devil Schuttig), a singular figure, leads the parade. His Häs is basically the same as that of the Schuttigs but all in black with red gloves and scarf. The wooden trident is the devil's 'weapon'. There is a lot of running at the beginning of the parade. The kids will tease the devil and provoke him to chase them with his trident. The Night Watchman and his Wife, who is always impersonated by a man, have an important role in the guild's internal meetings (which visitors won't be able to see). 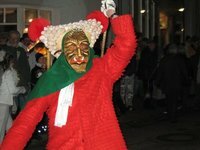 They walk at the front of the parade, followed by the Taganrufer (morning callers) whose duty is waking the town on Monday morning at 5.00. Then comes the brass band of the Stadtmusik in their pointed hats, who are playing one single piece, the Schuttig march, over and over again. Schuttigs and Rägemollis come in all sizes. 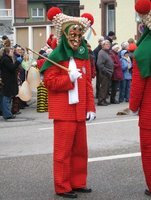 For the young members of the jester guild in Elzach the Fasnet begins already on Thursday with the children's parade. 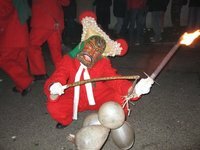 Hundreds of little Schuttigs and Rägemollis parade the streets of the town. On Friday and Saturday you'll see kid-size Schuttigs in the streets, but no adult is allowed to wear the Häs before Sunday at noon. The kids' Häs is the same as that of the adults. 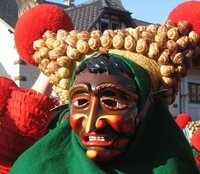 Very young kids will perhaps not yet wear the snail hat, only mask and headcover. 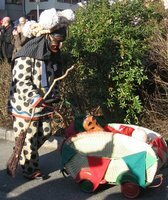 Even infants are taken to the parades in decorated prams, usually in a Häs, some with, some without masks. The youngsters join the afternoon parades on Sunday and Tuesday, but they are not allowed in the night parade. Since these parades are a big mess - the adult Schuttigs run, dance, beat the pavement with the Saublodere etc. - small kids are kept safely at Daddys hand as not to be run over. Older kids may go on their own. The safest spot for the youngest participants is on the kids' truck which runs at the end of the parade. These mini Schuttigs up there are about 3 to 5 or 6 years old. Elzach can easily be visited from Freiburg. Hint: Don't go by car, there is but one road along the valley which will be jampacked, and parking won't be found in the town centre, you'll have to park on the outskirts and walk quite a bit. Take the train (Breisgau S-Bahn). In case you come to see the night parade, though, you’ll have to hurry afterwards because the last S-Bahn towards Freiburg departs shortly after 22.00.